Louvain (Flem. Lewcen; Ger. Lowen), a town of Belgium, in the province of Brabant, situated on the Dyle, 15 m. E. by N. of Brussels; pop. in 1869, 33,171. The streets are regular, but the houses are not well built. 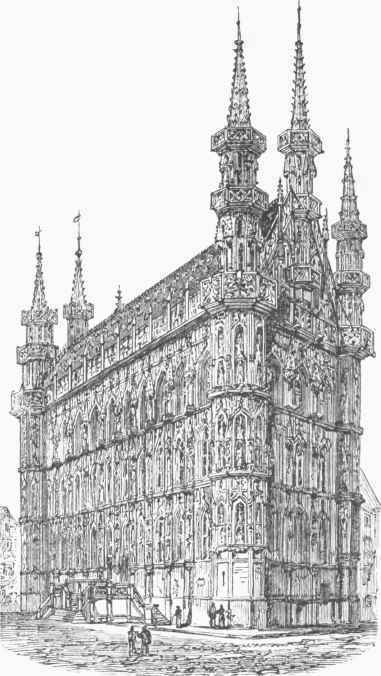 It is celebrated for its town hall, a fine Gothic building, for its cathedral, which is one of the most beautiful religious edifices in Belgium, and for its university, founded about 1425, at one time celebrated among the literary institutions of Europe, and still the leading school of Roman Catholic theology in Belgium, attended by about 800 students (6,000 in the 16th century), and containing 20 colleges (formerly 43), zoological and mineralogical museums, a botanic garden, and an extensive library. It was abolished by the French government in 1797, restored by the Dutch government in 1817, and again abolished by the Belgian government in 1834. In 1835 it was revived by the bishops of Belgium as a free Catholic university. It has the largest number of professors and students among the Belgian universities. Pope Adrian VI., Baius, Jansenius, and Bellarmin were among the most celebrated professors there. St. Gertrude's church and St. Michael's are noteworthy, the former on account of its celebrated oaken stalls with detached groups, statues, and bass-reliefs, and the latter for containing many of the best paintings of modern Belgian artists. Besides the many pictures of the Flemish masters in the cathedral, Louvain possesses a private gallery containing a very valuable collection of paintings by native masters. The town transacts a considerable business in the agricultural produce and manufactures of the country. The principal trade is in beer. Vessels of 150 tons can reach the town through the canal of Louvain. Although its activity is increasing, it presents a desolate aspect, compared with its appearance early in the 14th century, when it was the capital of Brabant, the residence of the dukes, and possessed a population of nearly 200,000 and nearly 4,000 manufactories of cloth. The weavers revolted against the duke of Brabant in 1382, and many of them, being banished, transplanted their industry to England. - The foundation of Louvain is attributed by some authorities to Julius Caesar, and the old castle is still called chateau de Cesar, although it is known to have been built at the end of the 9th century as a defence against the Northmen. The walls of the town, built in the middle of the 12th century, now partly turned into boulevards, measure 7 m. in circumference. During the war of the Netherlands against Spain, the town submitted to Don John of Austria, and subsequently withstood a siege by William of Orange. In the 17th century it was also unsuccessfully besieged by Frederick Henry of Nassau. Taken by the French in 1746 and 1792, it fell in 1793 into the hands of the Austrians, and was retaken by Gen. Kleber in 1794 and annexed to France, as the capital of an arrondissement of the department of Dyle. An engagement between the Dutch and Belgians took place outside of its walls in August, 1831, when King Leopold narrowly escaped being captured.